Remote Cash Control (RCC), the deployment of secure Cash Smart Safes (CSS) at merchant locations coupled with information reporting and provisional credit mechanisms, has been utilized for nearly 15 years as a means of improving merchant cash cycle control. Since 2004, when banks gradually began offering provisional credit based on validated currency residing at the merchant location, the industry has witnessed a surge in interest and adoption of these devices. For most merchants, couriers and banks, cash handling is still predominantly manual, but a growing number of institutions are starting offering Remote Cash Control products that sweeten the deal by offering provisional credit for deposits that are counted and validated by a "smart safe" that also provides audit trails for cash such as a Cash Recycler Machine (CRM ) or simply a Cash–In Machine (CIM). The primary benefit of RCC provisional credit is that it facilitates wholesale reengineering of the cash cycle within merchants and between merchants, armored couriers and bank cash vault networks. RCC removes the substantial burden of cash handling typically carried by bank branch personnel historically, largely without the assistance of meaningful automation. In a mature RCC model, there is a large population of retailers equipped with modern CSSs. Retail clusters are owned (or franchised) by Retail Company. Retail Company, based on a services agreement, is coming in collaboration with a bank, enjoying a number of benefits, primarily provisional credit for cash stored in the CSS device(s). Bank is monitoring the installed CSS via web communications through a supevisory system as the CMN System. One aspect of the scheme is how we may approach the different business entities, acknowledging a hierarchy from a business point of view. 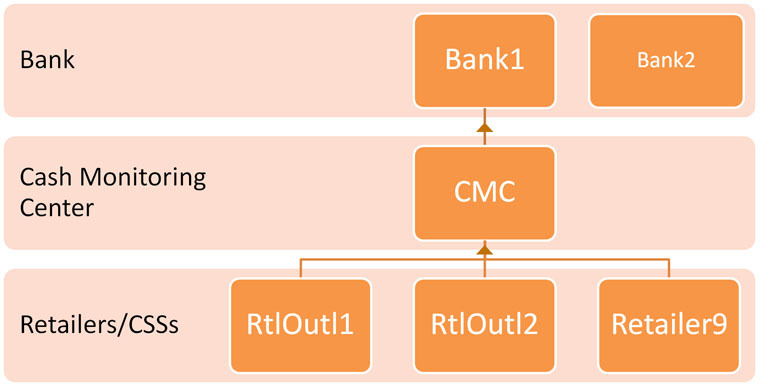 Looking in detail the business drivers and the business relationships (as they are articulated via binding legal agreements), the above diagram represents the so–called "RCC" business, led by one or more RCC companies, which is offering RCC services to a number of banks and is operating the CMC. Each bank has one or more client retail companies. At the end of the chain (actually an "inverted tree") each retail company owning/managing a chain of retail outlets, which may have (normally) one or (rarely) more CSS’s, connected on the CSS network. 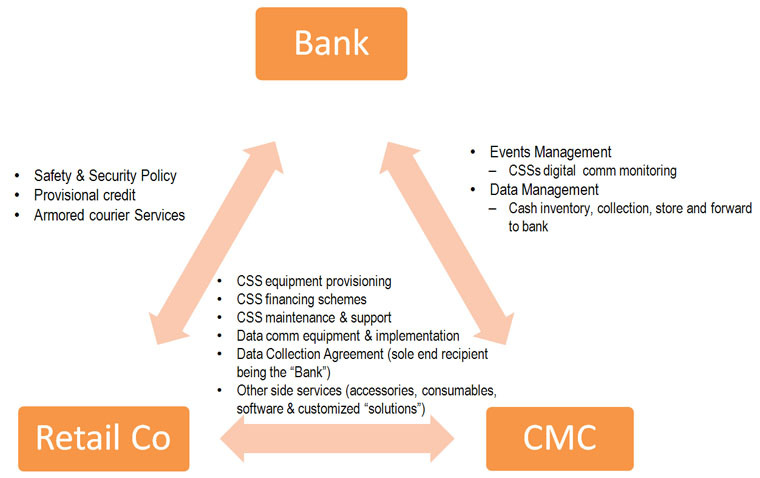 Practically the above diagram depicts the data information flow, where the CSS data (primarily the cash inventory) is collected by the CMC –in a store and forward manner– and then is forwarded to the bank owning the business relationship with the associated retail company.